During the second run of the ADAC Kart Masters, Mach1 Motorsport was once again able to impress and is developing into one of the strongest and most successful teams of the championship. On Sunday evening, as many as four of the 14 drivers had landed in the trophy ranks and Lucas Speck is now leading the KF2 overall list of rankings. A big challenge awaited team leader Martin Hetschel in Ampfing. Placing 14 drivers in five classes kept the team manifoldly busy and definitely successful. “After our success in Oschersleben we received a great reception. Now we have added Cedric Piro and Chris Dahlmann to our KF3 team and are hoping for good results there as well”, explained Martin Hetschel. Lucas Speck was the most successful driver in the KF2. After reaching 3rd place in Oschersleben, he was once again able to drive in the front field and finished his races on the excellent 2nd and 3rd positions. This put the Rhinelander at the top of the overall ranking, making him a serious candidate for winning the title. His team mate Manuel Valier was very fast as well. The race counted as a home match, being only 60km away from his hometown. After winning a Heat, theMunichresident secured a starting position in the front row. During the race he had to go one down though and came in 5th. He then experienced a serious setback during the second race, being involved in an accident at the start, which led to him having to hurry after the group of 28 drivers. After 18 laps he still managed to come in 13th and was able to gain important championship points. The third driver was Lisa-Christin Brunner. She was continuously involved in quarrels though and was not able to drive freely, only coming in 21st and 24th. The Swabians put three drivers in the KF3 as well. Next to permanent driver Johannes Gumbrecht, Chris Dahlmann and Cedric Piro drove their first race in a Mach1 Kart.Saarlandcitizen Piro had a really good start and drove the fastest lap of his group during qualifying straightaway. A defective part during a technical follow-up inspection threw him back to the end of the field, on 49th place, though. Luckily, Piro was not impressed by this. During the Heats, he fought his way up to 16th position and managed to leap into the top ten during the first race, coming in 9th. He had to deal with another setback during the second final then. After a quarrel during the first lap, he once again had to fight his way from the back of the field. However, his backlog was so big that despite constantly driving fast laps, he was not able to get past 21st position. Chris Dahlmann was on the same level as Piro as well. The youngster will compete in the U18 championship with Mach1 and used this race as preparation. After coming in 20th during the rainy Heats, he managed to fight his way up to 11th position during the first race under dry conditions. The second race unfortunately ended prematurely due to a collision that was not his fault. The racing weekend was less successful for Gumbrecht: due to two mediocre Heats he missed qualifying for the finals. 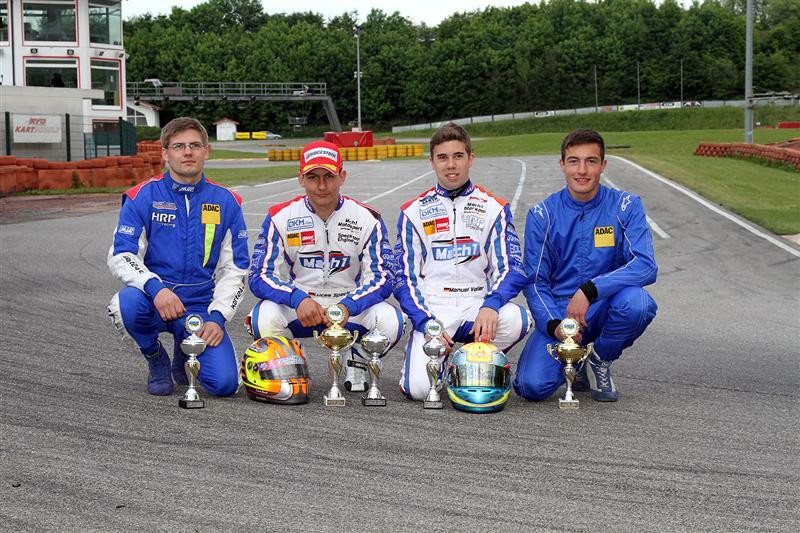 At the IAME X30 juniors, Mach1 Motorsport placed Axel Ausländer, Loris Prattes and Sebastian Schwendt in the races. The fastest driver turned out to be Schwendt: after reaching 3rd position during qualifying, he fought for a top five placement during the first race. A small driving error led to him falling back on 9th place though. He then experienced a huge setback during the second race. Due to an accident at the start of the race, he fell back on the 21st position. Loris Prattes bailed the team out, coming in 13th. During the first race he had been on 22nd position. Axel Ausländer has to shrug off his guest performance in Ampfing. He fell short of his own expectations during both races. Alexander Heil was a save candidate for a place on the podium once again. Ranking 4th during qualifying secured him a good starting position, which he was able to bring home during the first race. The second one ended before it started though. Alex had to make a pit stop due to a technical issue. The mechanics were able to repair the damage quickly but once back on the track, he lagged three laps behind his competitors and lost all chances to a good end result. His team mates Lukas Korsch, Baldur Bahn and Jan Jesse drove in midfield during the races and fought for positions from ten to 20. Toni Greif started as a soloist at the shifter karts again. Having started in a Mach1 Kart for the first time in Oschersleben, he was very comfortable in it quickly and always drove to gain more points. In the end he managed to increase his performance even more and earned a trophy, coming in 4th and 7th. The team’s next race will already take place next weekend. At the DMV Kart championship in Wackersdorf, the team will prepare for the upcoming race of the German Championship.